Neil D’Souza is an Indian engineer and a dreamer. His dream is to help the underprivileged children to receive a quality education. D’Souza’s passion to help the disadvantaged started during his time at Cisco. For four years, he worked there, mostly on mobile Internet and video technologies. During his free time, he would do some volunteering in San Jose, California. In 2011, he took the leap. He moved to Mongolia and spent a year teaching in rural orphanages. This is where he discovered the learning deficiency that affects most developing countries. His pupils were far below their grade level, lacking basic literary and numerical skills. D’Souza was aware of the ongoing online education revolution. He knew this could help his students to catch up. But without Internet, they had no chance to ever access the educational resources online. The more time he spent in Mongolia, the more determined he became to tackle this issue. He was even starting to develop his own solution when he met Soma Vajpayee. Vajpayee was the perfect partner for his project. She had been a Training Manager at Citibank for ten years and, just like D’Souza, she was passionate about using ICTs in the classroom. In 2012, they started Zaya Learning Labs. 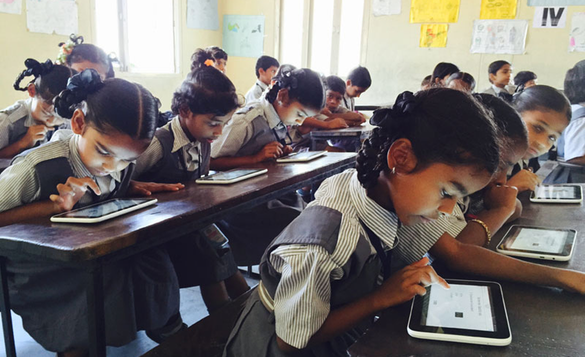 Their goal was to bring quality education to the bottom of the pyramid, starting in India. For years, India has been confronting an acute learning crisis. Although 96 percent of the children go to school, many do not reach basic literacy by 10. In fact, 60 percent cannot read a text, and 74 percent are unable to solve a division problem. One of the main reasons for the crisis is the lack of trained and motivated teachers. There is an estimated shortage of 1.2 million schoolmasters throughout India. Those who actually teach often lack both expertise and pedagogical ability. Since many in low-income private schools get only $100 a month, they also have no motivation. A majority of teachers even skip school at least once a week. All this adds to the curriculum’s low standards and large classroom sizes. So it is no surprising that the learning outcomes are so poor. To tackle this issue, D’Souza and Vajpayee created an innovative solution mixing education and a ClassCloud technology. On the education side, they developed a blended learning model in order to create a student-driven learning environment. The goal is that pupils stop staring out the window and instead engage with the teacher. This is why they divide the students into several groups based on their level. During the day, each group goes through three different learning times. While the schoolmaster teaches the first group, the second one reads or does homework. Meanwhile, the last group reviews their lessons using a computer or a tablet. It allows them to connect to the ClassCloud. This portable WiFi device contains all the resources for the class. There are lessons, but also instructional videos, educational games, and quizzes. To truly engage the students, Zaya developed a fun and friendly learning environment. The ClassCloud is also adaptive, so the pupils can learn at their own level and pace. Lessons and assessments are based on each student’s interests and needs, while also taking into account their progress. When they are consistent in finding the right answers, they can move to the next level. But if they aren’t, they spend more time on the topic. The overall goal is to guide them step by step towards their actual grade level. Once the students complete their assignments, the system generates a personalized analytics report. It is then sent to the teachers as well as the Zaya educational team. It helps them make the right interventions. For instance, it is easier to identify the students who lag behind and have the teachers focus on them. Zaya’s ClassCloud is a great Edtech solution, as it is particularly adapted to the constraints of developing countries. It is battery-powered and can run for ten hours without electricity. This is particularly useful in India, where power shortages are frequent. Finally, it works both online and offline. This is another necessary feature in India, as Internet penetration is around 12 percent. While offline, the ClassCloud stores all the data. It syncs it back to the cloud whenever it has connectivity. No wonder Zaya has become so popular among low-income schools throughout India. Over 100 schools have adopted it, and 30,000 pupils use it on a daily basis. For them, it has changed everything. They are now engaged in their learning and excited to go to class. More importantly, their learning outcomes increase. Can eVidyaloka Fix the Learning Crisis in Rural India? In 1954, the United Nations designated November 20 as the Universal Children’s Day. Seventy years have passed, but promoting the welfare of the youth has never been more necessary. Too many youngsters worldwide continue to suffer from poverty, abuse, and premature mortality. When it comes to education, the situation has improved, but there is still a long way to go. 121 million children remain unschooled; and 69 million adolescents have to drop out. Even for those who can enroll, the perspectives are bleak, as they often do not receive the quality education they deserve. With a 96 percent enrollment rate, India has almost achieved universal primary education. But the country is now dealing with an acute learning crisis that may threaten its development in the long run. A majority of students comes out of school without basic literacy and numeracy skills. Today, 60 percent of 10-year old pupils cannot read a text, and 74 percent are unable to solve a division problem. The reasons for this crisis are many, but they start with the lack of trained teachers. India faces a shortage of 1.2 million schoolmasters and a high absenteeism rate. Combining this with the curriculum’s low standards, it is easy to understand why the learning outcome is so poor. Many urban families respond to the situation by sending their children to private schools. But in the countryside where people earn less, most youngsters have no choice but go to public institutions. With their teachers being absent one day in five, the pupils often lose the motivation to study, and a majority drops out by the age of 14. In 2010, in Bangalore, two friends were troubled by their country’s educational crisis, but they had a dream. They were dreaming of solving it using ICTs. Some would have said such dream was unreasonable. But Satish and Venkat had what it takes to make a difference. They were passionate; they were skillful; they were pragmatic. Looking at the larger picture, they had realized that the level of education has increased in India over the past twenty years. There are now 40 million university graduates, and some are willing to share their knowledge with the less fortunate. As long as they do not have to leave their day job. While thinking about this issue, it became obvious for Satish and Venkat that the solution would come from the Internet. At the time, they found some inspiration in the Khan Academy, whose tutorial videos were more and more popular. But since they were focusing on under-educated children, they had to find a way to make the courses live. Back in 2010, the Internet was expanding in India, and Satish and Venkat took a bold decision. They started a nonprofit called eVidyaloka, traveled to isolated villages, and equipped some classrooms with video-conference materials. This way, the students would just have to go next door to take the class; and their teacher could be anywhere around the world. School failure should have been the fate of Rajesh. This 10 year old boy lives in a small village, in the state of Tamil Nadu, Southern India. Like most children there, he goes to a public school. Rajesh enrolled in the eVidyaloka after-school program before it was too late. And participating in this program has transformed the student he was. Before, he was not so passionate about school; now, he reviews his lessons. Before, he was struggling with math; now, he can solve the divisions by himself. Before, his English was terrible; now, he can speak in an articulated manner. The reasons for such progress? eVidyaloka teachers lecture in Tamil, Rajesh’s mother tongue. They also use videos and practical examples to explain the concepts. For the young boy, this has been enlightening, and he understands what he is being taught. And since the eVidyaloka program complements his school’s curriculum, it only took a few months for Rajesh to improve his grades! Implementing an ICT-driven project in rural India has not been easy for Satish and Venkat. They had to deal with power cuts, slow Internet speed, and even monkeys dislodging the cables. But they received a strong support both from the local communities and the Indian volunteers. This has enabled them to open 13 eVidyaloka classrooms in some of the country’s most underdeveloped regions. And their 179 teachers have changed the lives of more than 1,200 children. Just like young Rajesh, who can now consider going to high school!